The hour-star base and the frame are made of aluminum. As for the table top, you can freely match by yourself, MDF veneer or painted is available. 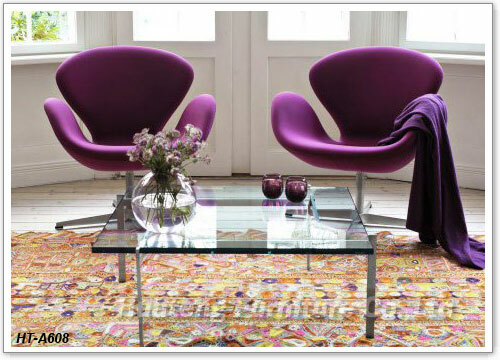 Designed by Arne Jacobsen, the swan chair is one of the most popular design till today. Fiberglass shell with full cashmere covered, high density foam inner, four-star stainless steel base with swivel function, all these features offer a relaxed and comfortable seating. Ok, thanks for your message, I'll send the furniture set price list to your e-mail box later. Thanks for your inquiry about our furniture set, could you please leave me your contact information? I'll send the price list with spec datas for your kindly reference.